Germany’s Deutsches Institut für Normung came up with the original standard for DIN car stereos (single din) before it was later adopted by the International Standards Organization and then used by all auto makers in the world. This standard specifies that the front dimension of a car’s head unit should be 180mm wide and 50 mm tall which is approximately 7 inches wide by 2 inches tall. However, for a double din, the height is doubled, like two DIN units stacked on top of each other. Therefore, a double din is still 7 inches wide but 4 inches tall , which is x2 the height of a single din. With this in mind, it is very important to consult your fit guide before purchasing any head unit so that it fits. This article takes a look at the best double din head unit on the market. Boss specializes in audio systems and even while they’re one of the youngest brands on this list, their focus on this particular niche has made them very notable among consumers. Apart from the unwavering attention on the design of their products , their lack of a storied pedigree hasn’t really allowed them to put so much of a price tag on their products. Therefore, Boss products are usually feature-packed at an affordable price. The digital media receiver of this Boss double din model includes the Apple CarPlay which provides a phone-like user interface from which you can easily browse through your phone’s map feature, music, contacts for phone calls and text messages through its 6.75” capacitive touchscreen. If you prefer wireless connections, you can tether to this best double din head unit through Bluetooth connectivity and enjoy the same quality of streaming service. It also has a high-res music capacity which means that you can connect through a USB drive and have both FLAC and WAV files playing endlessly in your vehicle. It features two rear USB ports, one rear view camera input and one rear auxiliary input, as well as six channel preamp outputs for the subwoofer, the rear as well as a 2V output in front. Given that the preamp signal only clocks in at 2V, this particular model might not be in the best for audiophiles who are in the market for a high-end stereo system. There is enough assurance provided for every user as this best double din head unit comes with 3-year warranty, in case buying cheap gives you creeps. Pioneer AVIC8201NEX Flagship in-Dash Navigation AV Receiver with Capacitive Touchscreen Display, 7"
Pioneer has grown into a large entertainment network with amazing features that screams innovation , and the AVIC-8201NEX is a perfect demonstration of how much they have grown. With the AVIC 8201 NEX , Pioneer blew minds with its highly customizable and responsive user interface which is designed to accommodate the smartphone-driven lifestyle as adopted by both technology-conscious millennials and their technology-curious parents. Being their flagship GPS navigation receiver, you wouldn’t expect anything less than a range of features that collectively outperform and outshine any other product in its niche. The AVIC-8201NEX features Apple CarPlay , which is a smarter and even safer way to tether your iPhone to your car, make calls, access messages, use maps and listen to music without much ado. However, this feature is also available for android users with Android Auto which just as much, tethers your phone to your car as well as provide and organizes useful information for you. It is designed to minimize the distractions you get from your phone while driving, while giving you just what you need when you need it. Without having to go through complicated set-up process or needing the help of a professional, you can easily pair your phone using a Bluetooth connection. Afterwards, when a previously registered device in is the proximity of your vehicle, it automatically connects and you’re good to go. Functions such as song search, better quality reception using the new Wideband Speech Handsfree Profile 1.6 which gives double the frequency bandwidth of common cell receptions, thereby making life in your vehicle even easier. The Pioneer AVIC-8201NEX has an impressively comprehensive map database from HERE® which provides routes to users to millions of destinations ranging from the United States to Canada and Puerto Rico, to name a few. The map lets you update to the latest map database available free of charge for the first 45 days. You can then update from the Navi extras website or just use “Total traffic & Weather Network” which also provides real-time traffic data for over 90 major cities without any subscriptions or ads. While the AVIC-8201NEX is surely one of the best double din head unit , its expensive price tag may be a setback for many , considering the many other affordable options available on the market. Like other best double din head unit , this SONY model partners with your smartphone to give you a convenient and hands-free control while providing you with high quality sound for your soul. 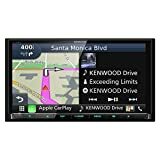 Conveniently, this 6.4” screen DIN unit features both Android Auto and Apple CarPlay and gives you access with simple voice commands and spoken directions as you drive. After the first connection, it automatically connects with your phone and saves you the trouble of reconnecting and doesn’t give you the chance to mess with the settings. Of all the head units we researched , the SONY XAV-AX100 performed best with Apple CarPlay and the icing on the cake is that it also works with Android Auto. It literally lets you use all the essential iPhone functions while you drive. After connecting with the USB cable, it provides you a familiar interface on your screen like a screen clone, with all buttons fully functional. By tapping icons, you can make calls, text messages, listen to your favorite songs on iTunes, Apple Music and installed apps. You can dictate messages and text them using voice commands using the Siri, whom you can also talk to. The same goes for getting directions too without diverting your attention from the road. Even though not as effective, the same goes for android connections too. Using the Android Auto, you have access to best-in-class voice recognition technology which imitates the iPhone’s Siri and gets you voice controls over the entire din service. Apart from the connection benevolence as portrayed by this unit , there’s also an authentic sound system with various setups as provided by the Dynamic Stage Organizer (DSO) which re-calibrates the output frequency of your music as they come out of your dashboard. As earlier mentioned , Pioneer is so far one of the most innovative companies offering the needed accessories for every driver ; from a quality GPS navigation, to OEL technology and even plasma display. With the AVH-4200NEX, they have continued in the same trend of exploring the boundaries of what can be achieved with a double DIN head unit through acceptable inputs and file formats. Only a few other double din units can accept file formats apart from the FLAC and WAV formats, but this pioneer unit does one better. It can actually play video formats from DVDs. However, while it cannot actually display the video on the screen, it can read the file and play it on other extensively connected screens in the vehicle. It can also accept inputs that most of other brands and models are faulted with, e.g., from USB drives and memory cards. The AVH-4200NEX is one of the units on the market that supports two separate camera lines that more frequently is used for the rear assist and lane correction systems for driving. Parking is much easier and even amateurs can drive freely in heavy traffic without upsetting some grumpy driver on the road. Its receiver also incorporates Pioneer NEX (network entertainment experience) which is an innovative combo of inbuilt features and cloud-based services that connect through to your smart phones and tablets. It interfaces your device like a clone or a Screencast when connected, and more importantly, it supports Android Auto & Apple Carplay but performs best with Android Auto. Supports Tune mix, traffic and weather now and sports flash using the SiriusXM Sxv300 tuner. The Jensen Brand of car stereo systems has been known to be quite reliable and have impressive features. It has been chosen as the best of our picks with regards to its top notch navigation feature. It boasts of a iGO primo GPS technology which is known to ease the process of following maps through routes. There are very detailed maps with about 11million points of interests spanning the whole of the United States, Puerto Rico as well as the US Virgin Islands. There’s also a lane guidance and junction view as well as speed limit warnings to get you out of trouble. Basically, it’s a best double din unit that any kind of driver would regard as a helpful companion. The Jensen VX7022 DIN unit isn’t just a navigation expert, but also just as reliable in other parameters. It has a 6.2-inch touchscreen interface which supports a max resolution of 800 by 480 pixels. With this kind of display, you can view any of your files (photos of videos) without affecting the crop ration or changing the size at all. It reads most of the popular formats including the MP3 and WMA for music, as well as the MPEG and AVI formats for video files. The sound, however, isn’t exactly the best on the market, since its peak output power is rated at 40Watts with 13W per channel as the nominal power. It supports five channels spread across to the rear, the front and the sub, so that you can at least enjoy the sound it can afford to give. Being one of the oldest high-end automotive electronics brands on the market, you can’t possibly expect less that pure quality transcended from years of experience and customer requests on upgrades. However, Alpine appear to have reclined a little bit in their most recent productions which is directed towards high-end luxry vehicles. However, the ILX-207 is their way of reminding consumers they haven’t lost perspective of the importance of high-end accessory for everyone. The ILX-207 is compatible with both Android auto and Apple CarPlay. However, it supports all apple products with the exception of the models lower than iPhone 5 and sadly, the iWatch. It features a 7-inch Visual Graphics Adapter display with a capacitive touch screen which is arguably not very responsive compared to its counterpart, but then works just fine. Also, there are 3 pre-amped outputs (4V) alongside a RMS wattage of 50 watts (x4) which isn’t exactly as good as the 2V outputs, but also works just fine. You might need to connect via the USB cable (instead of the seemingly easy Bluetooth) in order to get a full functionality from the connection. The Bluetooth only works for simple applications such as phone calls, but you would not have access to the full suite of apps without a direct USB connection. Kenwood is one of the oldest and most prominent brands in the history of electronics. However, since their fallout in the 80s, they have just recently made a breakthrough back into the limelight as they turned their attention towards the manufacture of high-end automotive audio systems and as an extension, made this list as one of the best double din head unit for audio productions. It has a 6.95” wide VGA color LCD display with a LED backlight which fits perfectly into vehicles without stress. It also features a 3 Preouts 5V preamp signal with a maximum output power of 50Watts (x4). There’s one rear AV input (mini-jack), one RCA video input for the rear view camera with a sound excellence DSP 13 which features 13 Band Graphic Equalizer, a digital time alignment sound realizer, a stage EQ, a bass boost among other cool features. The installer and backup memory can store and backup settings. The head unit also provides high and low pass filters that are quite uncommon (especially for their price range) and are very necessary for high-end audio quality. On the outside, it has a glossy finish and a capacitive touch panel whose top menu and background is fully customizable. The Apple CarPlay tethering to this din unit makes driving as easy as talking as your iPhone is integrated into the 7-inch screen via the cable with which yould also send and receive messages, phone calls, play music using a simple touch or voice activation commands. Since it works with Siri, you could search for spots such as hotels, restaurants and even filling stations at your convenience. The HDMI mode allows you to literally cast your phone on the din’s screen and operate. GPS navigation is not just with a superior functionality as explained earlier, but also has rich graphics. The inbuilt navigation requires a simple destination input for which it provides you with turn-by-turn voice prompts and variable route guides. You get accurate guides across all 50 states plus Puerto Rico and Canada filled with over 11 million interest points. You also get realistic 3D modeled terrains, buildings and metropolitan areas mapped for your convenience. Step 1: Have a list of all the desired features you would like your ideal Double din head unit to have. Step 2: Draw up a list of the top 10 brands that have the features/functionalities that you want. This list should also include prices and models. Step 3: You can prune that list to the best of four or five, from which you can now make your final selection. Your Double Din head unit is purposed to help you get the most from your car’s stereo system. It should also let you integrate the latest technological offerings in music streaming, app integration as well as GPS/Navigational capabilities via controls and buttons that are easy to reach and use. Selecting any model of best Double Din head Unit will depend on a number of factors that include your taste and requirements, the availability of a number of features and capabilities, the compatibility index/score, the price as well as the brand name/manufacturer. Just as important is your vehicle’s model and configuration. A Double Din unit should be able to help you enjoy your music/listening experiencing and still afford you the room to concentrate fully on your driving at the same time. The video below shows how to install a double din head unit , and this article gives further explanation. This is a great Double Din Head Units review. I got my best idea. Thank you so much for write this review and thanks again for sharing.